Live-action segment "The Marios Fight Back"
"The Fire of Hercufleas" is the fourteenth episode of The Super Mario Bros. Super Show!. Its corresponding live-action segment is "The Marios Fight Back". King Koopa uses of the Great Balls of Fire to attack Hercufleas. In the ancient city of Mythis, Mario, Luigi, Toad and Princess Toadstool are searching for a legendary hero named Hercufleas, who is an old friend of Toad's. Finding a statue of Hercufleas, Toad begins to rant to Mario, Luigi and Princess Toadstool, saying that Hercufleas is so powerful that he will be able to defeat King Koopa easily. Seemingly becoming somewhat bored by Toad's bragging about how Hercufleas is so great, Luigi yawns and suddenly notices a chariot pulled by Ostros and being ridden by Mouser quickly approaching. Mario, getting an idea, instructs Luigi, Toad and Princess Toadstool to jump on to some nearby pedestals and pretend to be statues. Striking various poses, Mario, Luigi, Toad and Princess Toadstool try to stand as still as possible as Mouser, getting off his chariot, begins to inspect the area. As Mouser looks around, Luigi, who has dust surrounding his face, begins to try desperately not to sneeze. After finishing his surveying of the area, Mouser hops back on to his chariot and rides away, saying he better file a report with King Koopa. With Mouser gone, Luigi finally sneezes, knocking himself and Mario off the pedestal. Getting off the ground, Luigi, having overheard Mouser talking to himself, says that King Koopa is in the area. Toad, having heard Luigi say this, says that King Koopa is no threat, as Hercufleas will be able to defeat him. Traveling through Mythis, Mario, Luigi, Toad and Princess Toadstool arrive at the home of Hercufleas, which is situated at the top of a large amount of stairs. After climbing all the stairs of Hercufleas' home, Mario, Luigi, Toad and Princess Toadstool find a cheerful Hercufleas who, instead of looking muscular and powerful, looks obese and lazy. Upon seeing Hercufleas slumped in a chair and surrounded by donuts, Princess Toadstool asks Toad if Hercufleas can actually do anything to help them defeat King Koopa. Rebuffing Princess Toadstool's question, Toad, after chuckling nervously, asks Hercufleas how his duty as a hero is going. Hercufleas responds to Toad's question be saying that he does not act as a hero anymore, instead acting as the guardian of the Great Balls of Fire, showing them a nearby urn filled with swirling fireballs. As Hercufleas approaches this urn, a fireball suddenly flies from the urn and after nearly hitting Mario, Luigi, Toad and Princess Toadstool smashes into a nearby wall, exploding violently. After this incident with the fireball, Hercufleas tells Toad that the Great Balls of Fire possess a lot of power and that it is his job to make sure that power isn't used for evil. At the nearby Koopacropolis, King Koopa is telling his Beezo minions that he wants the Great Balls of Fire and they are going to get it for him. After King Koopa tells the Beezos this, one of them tells King Koopa that the Great Balls of Fire are guarded by Hercufleas, who they wouldn't stand a chance against in a fight. Hearing the Beezo's concern, King Koopa tells him that Hercufleas is currently an overweight has-been, who can easily be defeated. Hearing this, the Beezos quickly leave the Koopacropolis and head towards Hercufleas' home, just as Mouser arrives to give his report to King Koopa. Standing in front of King Koopa, Mouser begins to bombard him with pleasantries as he tells him that Mario, Luigi, Toad and Princess Toadstool have been spotted in the area. After Mouser tells him this, King Koopa, not worried at all, simply tells Mouser that he'll be able to defeat Mario, Luigi, Princess Toadstool and Toad easily, once he gets the Great Balls of Fire. Outside the home of Hercufleas, the former hero apologizes to Mario, Luigi, Toad and Princess Toadstool that he won't be able to help them defeat King Koopa, saying that he isn't much of a hero anymore. Trying to reassure Hercufleas, Toad, as well as Mario, Luigi, Princess Toadstool and Hercufleas, here King Koopa's Beezo minions approaching. Passing Mario, Luigi, Toad, Princess Toadstool and Hercufleas, the Beezos enter Hercufleas' home and grab the urn containing the Great Balls of Fire. Seeing that the Beezos have grabbed the urn containing the Great Balls of Fire, Hercufleas tries to stop them, only to be knocked aside by the Beezos, who hit Hercufleas on the head with the urn. Getting off the ground, the angered Hercufleas begins trying to chase the escaping Beezos, one of whom instructs the others to fly away as he takes care of Hercufleas. Flying close to Hercufleas, who is out of breath, the Beezo proceeds to fly around Hercufleas' feet, tieing them together with a rope. After doing this, the Beezo, mocking Hercufleas, pushes him down the stairs of his acropolis before flying away. Sent tumbling downward, Hercufleas crashes head first into the statue of his much more fitter self, breaking off the top of it, which proceeds to land on Hercufleas. As Toad helps Hercufleas get up, Mario tells him not to worry, saying that he and Luigi will get the Great Balls of Fire back for him. Mario then leaves to search for the Great Balls of Fire, taking a hesitant Luigi with him. At the Koopacropolis, King Koopa is staring at the urn containing the Great Balls of Fire and telling himself how useful the Great Balls of Fire will be. As King Koopa continues to talk, a Beezo alerts him to the fact that Mario and Luigi are approaching. Unfazed by this news, King Koopa mentally manipulates three of the Great Balls of Fire out of the urn and sends them after Mario and Luigi. Seeing the Great Balls of Fire fast approaching, Mario and Luigi begin to run from them. Being chased by the Great Balls of Fire all throughout Mythis, Mario and Luigi, upon seeing a fountain, jump into it and using a pipe as a blowgun, Luigi shoots some water at the Great Balls of Fire, sending them away. As the Great Balls of Fire zoom away, Luigi realizes that, with the Great Balls of Fire under his control, King Koopa will be unstoppable. Reassuring Luigi, Mario tells him that they may need to help to defeat King Koopa and suddenly gets an idea concerning Hercufleas. At Hercufleas' acropolis, Mario and Luigi begin trying to convince a depressed Hercufleas to help them defeat King Koopa; unfortunately, Hercufleas is reluctant to do so, until Mario and Luigi mention that they can get him back into shape through the use of the The Official Brooklyn Plumbing Academy Workout. Afterwards, Hercufleas begins training. Unfortunately, he does terrible at running, chin-ups and jumping jacks, but, after a long while, does manage to get better. Eventually, Hercufleas becomes muscular once again and excels at his training. After quickly running up the stairs of his home once more, Hercufleas thanks Mario, Luigi, Toad and Princess Toadstool for helping him get fit again and tells them that now he can beat King Koopa. At the Koopacropolis, King Koopa is using a large trident to roast several marshmallows over the Great Balls of Fire and orders Mouser to bring him even more marshmallows. Carrying a large platter covered in marshmallows over to King Koopa, Mouser hesitantly tells King Koopa that maybe he shouldn't be using the Great Balls of Fire to roast marshmallows and should instead be using them to destroy their enemies. Hearing Mouser, King Koopa tells him that there are not any enemies for him to destroy, saying he has already incinerated both Mario and Luigi with the Great Balls of Fire. Directly after King Koopa says this, Mario, Luigi, Toad, Princess Toadstool and Hercufleas enter the Koopacropolis and alert King Koopa to their presence. Seeing Mario, Luigi, Toad, Princess Toadstool and Hercufleas, King Koopa briefly wonders how Mario and Luigi survived his attack on them with the Great Balls of Fire earlier, but after wondering this, proceeds to simply taunt Mario, Luigi and Hercufleas. Approaching King Koopa and Mouser, Toad, defending Hercufleas, throws his own insults at King Koopa. Angered, King Koopa orders his Beezo cohorts to attack Toad and drop him into the urn of fire. Following King Koopa's command, several Beezos suddenly appear and grab Toad, flying him over to the urn containing the Great Balls of Fire. Stopping over the urn, the Beezo drops Toad, hoping he'll land in the urn and be fried by the Great Balls of Fire. Seeing Toad in peril, Hercufleas grabs the platter of marshmallows from the nearby Mouser and throws it over the top of the urn. Falling on to the recently plugged urn, Toad, the impact of his fall having been absorbed by the marshmallows, quickly hops on to the ground. The Beezos, seeing Toad getting away, quickly try to dive-bomb him, only to crash into the platter of marshmallows, all of which have turned into stickly goo, which traps the Beezos. With his Beezos defeated, King Koopa, manipulating the Great Balls of Fire, sends one towards Hercufleas, who easily bats it away with a pillar he tore from the ground. King Koopa, becoming desperate, begins to send fireballs all over the Koopacropolis, all of which Hercufleas, Mario and Luigi knock away easily, with Hercufleas using a pillar as a bat and Mario and Luigi using pipes. Unfortunately, in the confusion of the battle, Toad, being chased by a fireball, tumbles off the Koopacropolis. As he falls, Toad manages to grab hold of a Fire Flower, which had been sticking out of the ground. Upon touching this Fire Flower, Toad becomes Super Toad and, using his new powers, flies back to the top of the Koopacropolis to battle King Koopa. Sending several fireballs towards King Koopa, Toad gets into a literal fire-fight with him, with both Toad and King Koopa sending waves of fireballs back and forth at each other. Eventually, King Koopa notices that he has used up the Great Balls of Fire and is now defenseless. Panicking as he is approached by the heroes, King Koopa suddenly sees Mouser nearby, riding an Ostro-pulled chariot. Before he can be stopped, King Koopa jumps on to Mouser's chariot and quickly drives over the horizon. Though King Koopa has been banished from Mythis, the Great Balls of Fire are no more, which disappoints Hercufleas. Seeing the troubled Hercufleas, Toad tries to re-ignite the Great Balls of Fire with his own fireballs and after a few seconds, manages to do so. At the acropolis of Hercufleas, Hercufleas, Mario, Luigi and Princess Toadstool are in the midst of congratulating Toad for his heroic work; as Princess Toadstool praises Toad, she says that, next time she needs a hero, she'll know exactly who to call and motions towards a large statue of Toad, which has been built next to the repaired statue of Hercufleas. In the scene where King Koopa mocks Hercufleas in the Koopacropolis, his left fang noticeably switches from being white to green several times. After King Koopa commands the Beezos to retrieve the Great Balls of Fire from Hercufleas, his voice slowly gets higher when he says "Why am I cursed with such mush-headed minions?" 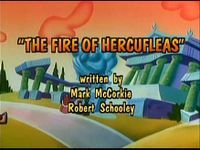 Hercufleas is a reference to the Roman mythical hero Hercules, but with a Greek theme. Incidentally, the Greek figure is actually named Heracles. The Latin name Hercules, like the later Disney film, was obviously chosen for its easier to pronounce name. The training montage is an parody of the iconic sequence from the film Rocky. Toad's Super Toad form resembles his old appearance from the first two episodes of the Super Mario Bros. Super Show, in which the colors of his outfit are reversed. This page was last edited on March 3, 2019, at 19:56.